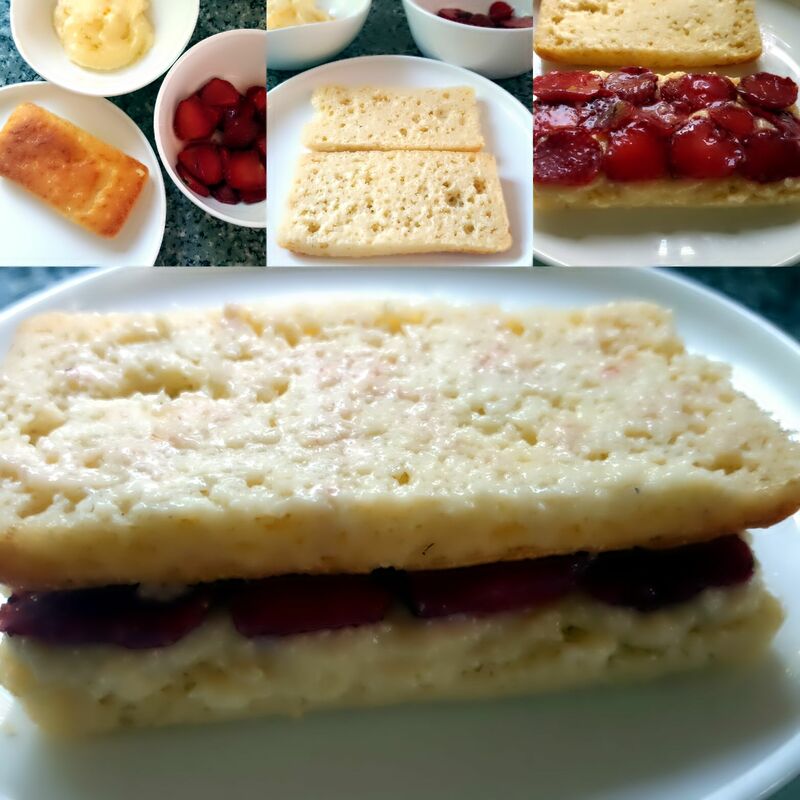 It’s strawberry season here at the moment and what’s better way to use them than making strawberry shortcake, my all-time favorite dessert. I remember years ago, the strawberries we could get here were imported and prohibitively expensive. There were locally grown ones too but they were really tart. The season was short as well, lasting only a few weeks. The only way to use them was to make jam or you could use it to decorate cheese cake or tarts, just for the look because no one would eat it. 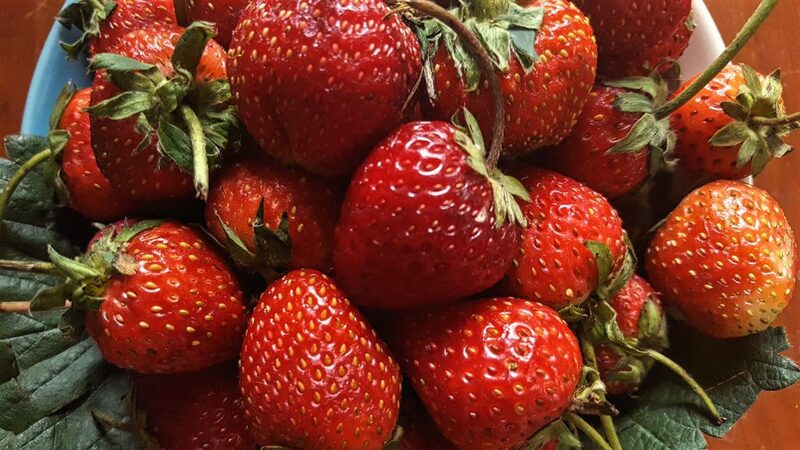 I saw strawberries sold on the street or at the market and they would come with sugar and chilli mix for you to dip your strawberries in. Sort of like in Mexico where you get freshly cut fruit sprinkled with chilli and lime. The difference is that here we have the combination of sugar, salt and chilies. It’s common practice that people would have this chili sugar dip with any kind of sour fruit. 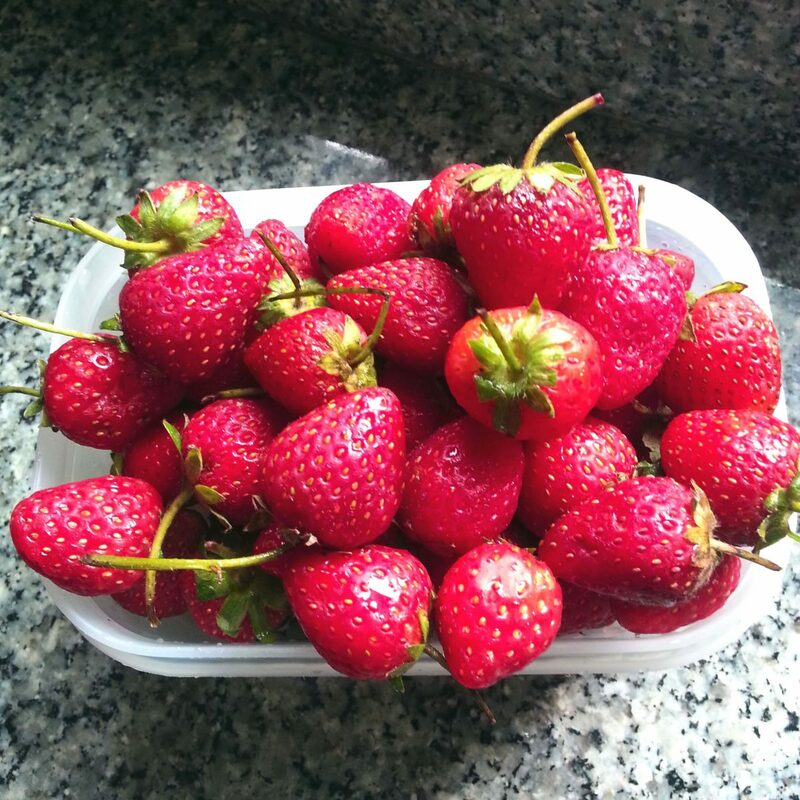 Last year when we came back to Thailand, I found the new variety of strawberries at the market. They were tiny but boy were they sweet. I don’t know what kind but they were like the ones I once had in England, small but tender, juicy and sweet. Hope I don’t upset anyone carrying on about fruit. I couldn’t help getting excited when we got some nice local berries at a reasonable price and they are so tasty. Now back to the subject at hand, strawberry shortcake. I know on Keto people have to curb their carbs. I never thought anyone would be out for blood when my husband posted the picture of our strawberry short cake on his Facebook. That individual attacked us for having 4 strawberries on the short cake, 4 tiny strawberries!! Berries are keto-friendly and depends on how clever one can be incorporating it in their diet. It’s not written in stone. People need to use their judgement on the amount that fits their daily requirements. We don’t make our dessert very sweet in all our recipe and the above recipe contain only a few drops of stevia in the whipped cream. The strawberries in itself was sweet enough. For me it’s an great way to use up the leftover pancakes. However, in this recipe we will make it a bit more legit. The base would be sweet biscuit, topped with sweetened whipped cream and macerated strawberries. Our biscuit base is rather soft but not feather-light like sponge. It serves the purpose as the base. Together as a whole it’s not overly sweet. Most recipes I saw use much more sweetener but we just like ours sweet enough to taste. But remember you can adjust it to your liking. We use a mold that makes 4 biscuits like this one. Once your biscuits are done and cooled completely, cut each one into two slices and build your shortcake with whipped cream and strawberry layer, then the other biscuit slice, whipped cream and strawberry on top. 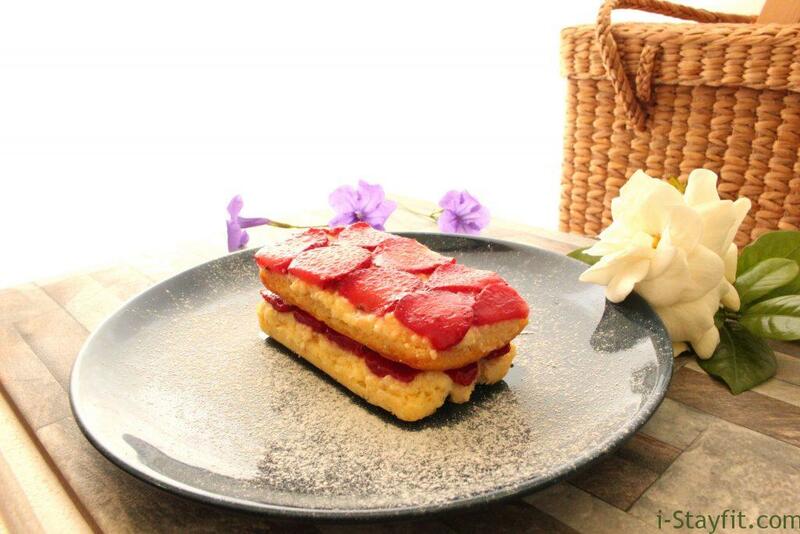 Arrange your strawberry slice according to your artistic flair. Mine is limited so I’m sticking to the most basic arrangement. It may seem our strawberry short cake hasn’t got much cream on it. Feel free to use as much whipped cream as you like but please remember to recalculate your macros. Combine all ingredients in a bowl and mix with a fork or hand blender till smooth. 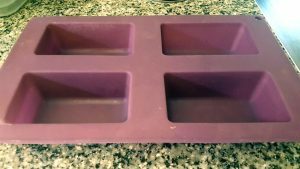 To bake, pour the mixture into a cake tin. We use a four-hole silicon mold that gives 4 oblong shaped biscuits. If using a big tin, you will have to cut into quarters to make 4 servings. Bake at 180°C for about 20 mins. It could take longer or shorter depending on the oven. Take the biscuit off the tin or molds and leave out to cool. Sprinkle Swerve on top and toss lightly to combine. Let it sit in the meantime. Whip the cream and vanilla extract and sweetener until stiff peak forms. With a bread knife or a sharp knife, cut the biscuit horizontally to divide it into two slices. The biscuit should be cooled to room temperature. Use a spatula or a butter knife to spread half of the cream evenly on top of the first biscuit slice. 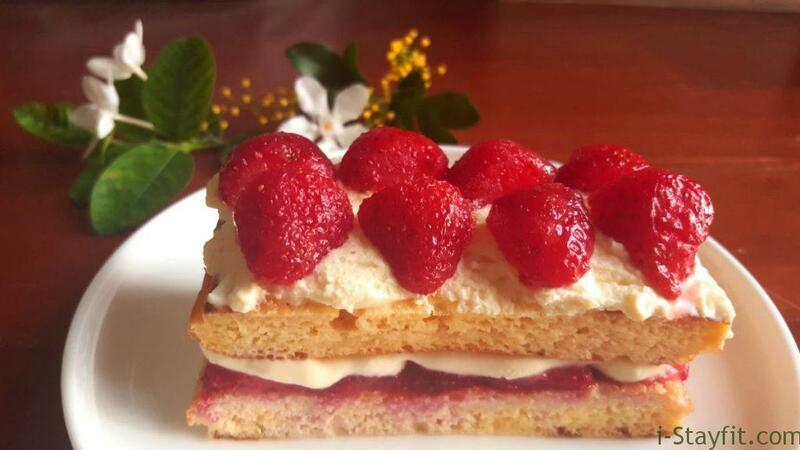 Arrange half of the strawberry in single layer on top of the cream. 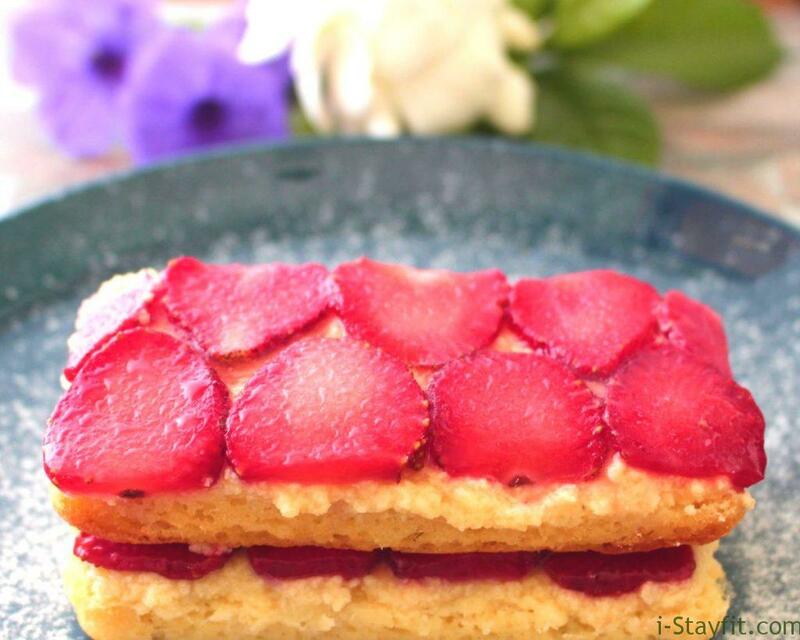 Repeat the process by placing the other biscuit slice on top of the already assembled shortcake. Then spread the rest of the whipped cream evenly on top and arrange the strawberry slices on top. Keep in the fridge till ready to serve. This recipe is only an idea on how you can adapt regular dessert to be keto-friendly. Like most of our recipe, you can always adjust it according to your taste. In this case, if you like more cream, by all means, add more. The strawberries we use is the bare minimum to keep the carb low but feel free to add more. All you have to keep in mind is that it will change your macros and you will need to recalculate it.